The ADAMI Media Prize is waiting for your entries! ADAMI initiative aims at increasing interest and coverage of ethnic and religious minorities, civic integration and cultural diversity topics within the audiovisual media of the six Eastern Partnership countries (Armenia, Ukraine, Georgia, Moldova, Azerbaijan, Belarus) and therefore has launched international media competition awarding outstanding films, TV and online programs promoting cultural diversity and intercultural dialogue. 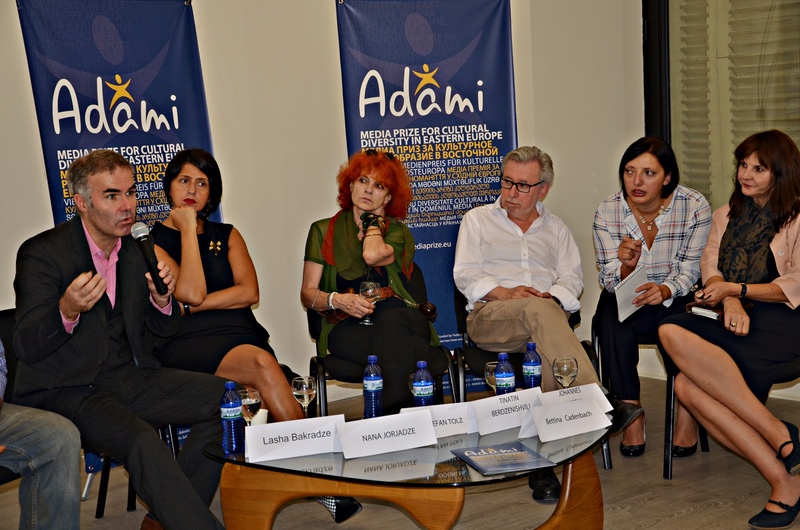 ADAMI is funded by the Foreign Office of the Federal Republic of Germany and supported also by the CIVIS Media Foundation, the EBU (European Broadcasting Union), Deutsche Welle, Georgian Public Broadcaster and National Television of Ukraine. Submissions can be entered until October 25th, 2015 (entry deadline). Participating broadcasters, production companies, educational institutions and individuals must register at the website www.adamimediaprize.eu and send two DVD with the filled out entry form to Tbilisi office. For details please see regulations provided on the ADAMI's website.